E-Bikes are environmentally friendly. 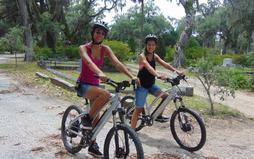 Go green in Savannah with an E-Bike tour that's full of battery powered fun. 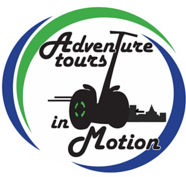 Adventure Tours in Motion provides a green adventure for the whole family, including the family dog. 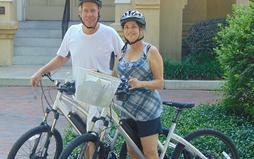 E-bikes are perfect for touring the streets and squares of Savannah. Sit down, relax and let the bicycle do all the work. You can choose between pedal power and electric throttle power. We have small bikes for children and child carrier accessories for the little ones to hitch a ride with Mom or Dad. Our electric tandem bike is a fun bicycle built for two that allows younger children to actively participate in the adventure and the fun. Located near Historic District Savannah, these beautiful showplace cemeteries are the resting place of many famous people and stunning architectural eras. 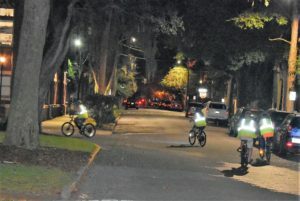 As you take your Savannah E-Bike tour through the fabulous live oaks draped in Spanish Moss; listen close...you might hear Johnny Mercer’s “Moon River” traveling through the breeze. So, pick between Bonaventure or Laurel Grove or do both! Tybee Island is located just 25 minutes from historic downtown Savannah. 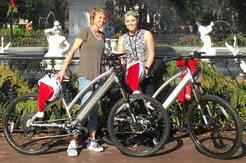 A 60-minute Savannah E-Bike tour is an innovative way to get around the north beach area. This is the perfect tour for those who want to ride without having the traffic of downtown. 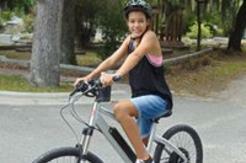 This exclusive E-Bike Tour is a perfect way to enjoy Family Fun! 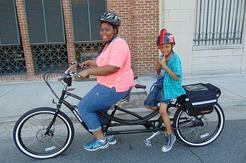 Adults and children alike will appreciate the fast pace of the E-Bike while zipping around the squares of Savannah. No need to pedal when you can cruise your way around our beautiful city. Gratuity is not included in ticket price. Tipping your Tour Guide is customary if you enjoy your tour, but it is not mandatory.